Written on December 11, 2018. Written by admin. Gift Certificates Available in All Amounts! Give us a call at 347-227-8227 (we can even mail one out to you and process the costs over the phone) or just stop in and ask. Happy Holidays! Written on November 8, 2018. Written by admin. Black Gold and Van Brunt Stillhouse Party This Saturday! Written on September 28, 2018. Written by admin. 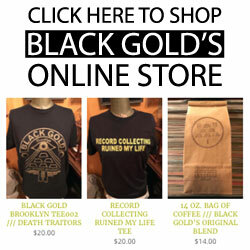 Black Gold Brooklyn Lives On! Written on September 19, 2018. Written by admin. Written on April 27, 2018. Written by admin. Written on April 2, 2018. Written by admin. Written on February 9, 2018. Written by admin. Black Gold is coming to Artists & Fleas SoHo on Monday, January 29th. Written on January 23, 2018. Written by admin.